Please note: If you have applied for a specific dog and are curious about the adoption status of that dog, please check the animal’s Petfinder bio. Updates will be posted there on a regular basis. We thank you for your application and ask that you continue to check his/her Petfinder bio as it will be posted there first if the dog has an adoption pending. Unfortunately, because our rescue is 100% run by volunteers, it is sometimes difficult for us to contact every applicant about the current status of the application/animal. Thank you for your understanding! Cross Our Paws’ adoptions begin with filling out an adoption application (must be over 21 years old to apply) followed by a home visit if we feel the application is a good match for the animal. All our rescues are cared for in foster homes and in order not to be too disruptive to our volunteers, we pre-approve all applicants prior to a meet and greet. Our adoptions start with a one to two week trial foster to adopt period to ensure that the animal is a good match for your family. Cross Our Paws generally limits the adoptions of our “special needs” animals to the Lower Mainland area so that we can assist with any issues that may arise. It is also a policy if you have a yard, it must be secure at least in the rear. We do adopt to apartment/condo dwellers if strata permits and the dog is suitable to be in a multi-family complex living arrangement. As we are all volunteers we try to reply as quickly as possible to all inquiries but it may take up to 48 hours to do so. To follow the adoption status of our adoptable dogs please keep checking our Petfinder site for updates and new rescue posts. CROSS OUR PAWS requests an adoption donation for all our rescues as we could not rescue without it. Your donation will vary depending on the animals care and vet expenses and age (recommended donation: seniors – 8 yrs+ $150, adults over 12 months $395 and puppies are $450). Your donation will go towards helping pay for any vetting, care and other miscellaneous expenses we may have accrued while the animal has been in our care. If the donation exceeds the animal’s vetting, care and transport, the remaining amount is always applied to other dogs in need of rescue and care. IMPORTANT NOTE: All puppies MUST be spayed/neutered no later than 6 months (prior to puberty) at the rescue’s vet which is prescheduled and mandatory. Adopters are notified/reminded in advance via email of their alteration date. Failure to comply will void the foster-to-adopt agreement. Proof of Alteration – Spay/Neuter Certificate (ALL dogs/cats are spayed/neutered by the rescue if they arrive intact). Mandatory neuter of puppies at 6 months of age (included). Before adopting please consider the time and commitment that goes into caring for a pet. There are medical, food and training expenses etc. and more importantly your precious TIME. It’s also important to consider the breed of dog you are applying for as well to ensure a great match for both. Many of our dogs are great with kids but some dogs are not suitable to live with children which is something to consider when applying. If you are not familiar with the breed of dog you are interested in research the breed before making your final decision. To ensure you and your canine companion are happy and content and your dog knows what you expect of him/her enroll in obedience training as soon as possible (however, don’t expect the above). Cross Our Paws Rescue has many wonderful canine trainers to recommend in your area. Unless otherwise stated all adoption donations are non-refundable and goes towards covering our veterinary and supply costs. GSRBC requires that if there is a yard, it must be securely fenced for our adopted dogs. Exceptions to the fencing policy are occasionally made for “senior” dogs (age ten or older) and only on a case by case basis depending on the needs of the individual dog. GSRBC along with other rescue organizations have adopted this policy to ensure the safety of our rescued dogs. We are routinely quizzed on the reasoning behind this policy and have listed some of the most common arguments we hear. With respect to Rescue dogs in specific, we believe a fenced yard is necessary to ensure their long-lived happiness and well being. This does not mean that you have to have a yard in order to adopt. Some of the very best homes our dogs are living in have no yard at all, and there is no risk of them being outside and off leash with the dangers of traffic, theft, etc. By natural instinct, dogs live and love to chase things. A dog will run after just about anything that moves, just for the fun of it. Deer, squirrels, birds, opossums, cats, and even a plastic bag floating in the wind represents a rowdy game of chase to most fun loving dogs. If there is no boundary (fence) to stop the dog, the game will continue into the next city. 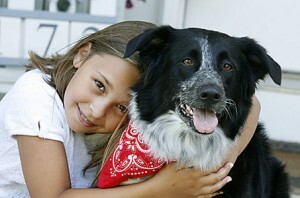 Most dogs are very social animals they love everything and everyone. They will run up to anything to see if it will engage in a game or give a loving pat. They are heedless of things like a roadway with cars in between them and the children they seeing playing ball across the street. Everyone deserves a safe place to run free, exercise and play. Picture life constantly on a leash, never being able to chase and pounce on a ball or just run some laps for the fun of it. Without safe, secure boundaries to romp in, a dog will become bored, hyper and destructive. Dogs require exercise to maintain healthy bodies and joints. Without the ability to run and play freely, they can become obese and out of shape. Regular exercise keeps them fit and healthy. Even the most well trained dog still needs free space to do their own thing unencumbered. Dogs are taught to “heel” (walk politely by your side on a leash) and most dogs will do so very nicely. While this is fun for the person walking the dog, it is not fun for the dog as their only means of exercise. Life would be very boring if you had to spend your entire life walking right beside someone without ever getting to go where you wanted to go, smell what you wanted to smell, etc. The older they get, the less exercise they require, however, all dogs, be they 6 weeks or 16 years old love a daily romp and the ability to just kick up their heels a bit. As stated before, most dogs love to chase things. Many excited dogs will forget about the shock or decide the shock is worth the fun and chase the deer, ball, child, etc. right out of the yard anyway. What they won’t do, is come back into the yard when it’s over because, now that the excitement of the chase is over, they know the shock is coming. In addition, there have been reports of dogs “freezing” at the transmitter line and getting repetitively shocked over and over again. This type of fencing only affects the animal wearing the special collar. It does not keep things out of the yard. It won’t stop other dogs, animals, people, etc. from coming into the yard and harming, attacking, or stealing the dog. Any of these can go dead, be lost or interrupted at any time without warning, and render the ‘fence’ useless. Electrical containment does have merits and is very effective at keeping dogs out of forbidden areas such as flowerbeds, gardens, certain rooms/areas of the house, etc. electrical containment does not suffice as a primary barrier fence under COP policy. We’d prefer it if our dogs did not get “shocked” at all. Lastly, let’s face reality, even the most diligent owner has bad days, bad weather or is just too rushed. Example #1: It’s midnight, cold and raining and the dog has to go outside to potty…are you really going to get dressed and take him/her for a walk? So, just this once, you let them out “just to go and come right back while you stand there and watch…” Then, a squirrel runs by, the dog takes off after it and you’re in no condition to chase it. Dog runs into street, and gets hit by car… OR Dog runs off and you can’t find it. GSRBC’s fencing policy is for the benefit and well being of the Dog. It is not meant to imply that all homes without fencing are not capable and diligent owners. Experience has taught us that dogs do best in fenced environments. A number of dogs are surrendered to GSRBC because the owners don’t have fencing, or have moved to unfenced properties, and felt their dogs were not happy or doing well in that environment. GSRBC’s sole intention is to provide the best, safest and most loving home we can for our dogs in need. All dogs deserve a safe area to be able to run and play in. A fenced yard is NOT a substitute for exercise, and no dog should be left outside to live there!